The ATO depreciation rates determine tax deductions which represent the decline in value over time of assets which are associated with your income-earning activities. 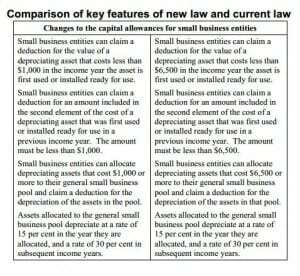 [April 2019] Small businesses: A $20,000 threshold for accelerated small business depreciation claims has been increased to $30,000 on an asset-by-asset basis and extended until 30 June 2020 under proposals announced in January 2019 and expanded upon in the Budget 2019 announcements. The Treasury Laws Amendment (Increasing and Extending the Instant Asset Write-Off) Bill 2019 has been approved by the parliament. Budget 2018: The government has extended the small business $20,000 asset write-off provisions for a further 12 months until 30 June 2019. Small businesses will be able to immediately deduct purchases of eligible assets costing less than $20,000 first used or installed ready for use by 30 June 2019. The deduction rules also apply to pool balances of less than $20,000 (as before). The time extension also applies to the relaxation of 5-year lock-out rule, enabling re-entry of small businesses to the increased threshold arrangements, who would otherwise be barred through having previously opted out. Instant asset write-off: Small businesses to get immediate deduction for the cost of assets acquired which are less than $20,000 (up from the current $1,000) to be available from 7.30 pm 12 May 2015 initially until 30 June 2017 but since extended). A small business year-end asset low value pool balance of less than $20,000 can also be fully deducted. See more here. Assets such as horticultural plants and in‐house software for which specific depreciation rules already apply are excluded. The current 5-year bar on re-entry to simplified depreciation after opting out is suspended. from 1 July 2016 12 May 2015 primary producers will be able to immediately deduct capital expenditure on fencing and water facilities (currently 30 years and 3 years respectively) and write off fodder storage assets over 3 years (currently 50 years). See Primary producers. A full write-off for fodder storage takes effect from 19 August 2018. See further under Primary Producers heading below. Enabling legislation giving effect to these measures has now been passed by the Federal parliament, see Small Business concessions. The $6,500 (and related $5,000 motor vehicle) Small Business asset write-off concessions were removed with effect from 1 January 2014 under the Mining Tax repeal legislation. Small Business write-off concessions revert back to the $1,000 limits for low pool assets and normal rules for vehicles. The accelerated depreciation concessions were in place for the period 1 July 2012 to 31 December 2013. The tables provide an estimated life for assets as determined by the Tax Office. For more about how and when to use these rates, see ATO Depreciation Rates. You don’t have to use the Commissioner’s estimate when determining the effective life of an asset for depreciation purposes. The alternative is to choose to self assess. For information about the self-assessment process, see: Self Assessment of Depreciation rates. The Tax Office has issued a draft ruling TR 2017/D1 containing guidance on how and when to treat depreciable components as separate assets, or as a single asset. ‘Effect of attachment’: the item, when attached to another asset having its own independent function, varies the performance of that asset. There are 13 practical examples discussed in the draft ruling, including industrial storage racking, a desktop computer package, mainframe computer system, local area network, aircraft engine and airframe in service on rotation, car GPS, jointly held fibre optic cable communications system, electricity distribution line, replacement electricity pole, upgrade of transformer, rail transport infrastructure, new railway branch line, solar power system and photographic lighting equipment. Broadly, depreciation is a special deduction for costs which provide a benefit over more than one financial year. Each category of depreciation claim has specific rules and circumstances. There are categories which allow immediate deductions, small business entity claims, low value pools and the software development pool, and for miners and primary producers. If your circumstances don’t match (or in some cases if you don’t choose) one of the specific categories, then there are general claims which can be made under more general rules for “depreciating assets” – see below “Depreciation Methods“. Here’s a brief listing of depreciation rules and categories. The term “depreciating assets” is widely defined – this is a general category; but there are some assets which can’t be claimed for depreciation: See Section 40-30 “What a depreciating asset is” and also note Section 40-55 (Use of the “cents per kilometre” car expense deduction method). Effective from 9 May 2017, Div 40 has been amended to deny depreciation tax deductions for ‘previously used’ depreciating assets used in earning income from residential premises used for residential accommodation. Assets acquired before 9 May 2017 will not be affected. Future deduction claims will be restricted to assets acquired by the taxpayer. Low-cost assets costing less than $1,000 * and assets which have been depreciated under the diminishing value method to less than the Low Value can be optionally bulked into a “Low Value Pool“, with a single arbitrary depreciation write-off schedule. ( see Section 40-425). If the choice is not made, depreciation is determined under the generally applicable effective life rules. Assets in the Low Value Pool have only one method of depreciation, diminishing value, over an assumed effective life of 4 years. The taxable use percentage must be estimated, and can’t be varied. The general depreciation rules under Div 40 include “in-house” software as a depreciable asset. Note: Payments for software in the nature of annual licence fees (such as for tax and accounting software) are generally considered to be business outgoings which are fully deductible when incurred, and are therefore not required to be treated as capital expenditure. “In-house” software by definition includes computer software acquired, developed or commissioned mainly for the taxpayer to use. Excluded is software which is trading stock or which is deductible elsewhere under the tax rules, or which is in the nature of an annual renewal or subscription which would be fully deductible as a business outgoing. Subject to eligibility, non-revenue costs of in-house software may alternatively be allocated to a Software Development Pool. Expenditure on the development of in house software can be allocated to a “Software Development Pool” which provides for a write-off over 4 years – extended to 5 years from 1 July 2015 (see table below). Once a pooling choice is made, all similar expenditure must then be allocated to the pool. (See Section 40-450). Immediate deductions (whether capital expenditure or not) are available for exploration, prospecting, rehabilitation, petroleum rent resource tax and environmental protection. (See section 40-730 and tax ruling TR 2017/1 Income tax: deductions for mining and petroleum exploration expenditure. Section 40-755 provides a deduction for expenditure which has the sole or dominant purpose of carrying on ‘environmental protection activities’. Environmental protection activities are those related to a taxpayer’s income-earning activities and include preventing, fighting or remedying pollution and dealing with waste. Black hole expenses are (otherwise) non-deductible capital expenses associated with a business. Sec 40-880 provides that these expenses be deducted over five years – at the rate of 20% each year. See also TR 2011/6. – such costs being pooled and written off over the life of the project according to formulae in Sections 40-830 and 40-832. Above are listed various types of depreciation claim categories. For everything else, Section 40-30 has a general definition of a “depreciating asset” (and importantly lists some exclusions, such as land). The choice is between Diminishing Value and Prime Cost methods of calculating the depreciation for the year (or part year if applicable). The diminishing value method tends to bias the depreciation amount in the earlier years. The Base Value is initially the cost, but this can be modified by later improvements and the forgiveness of commercial debts. The Prime Cost method allocates the costs evenly over the years of ownership. Note also that where applicable, luxury cars have an upper depreciation limit. The choice of self-assessment or Commissioner’s estimate is not available where an asset has been acquired from an associate or when the end-user hasn’t changed, as in a sale and lease-back situation. The Treasury Laws Amendment (2017 Enterprise Incentives No. 1) Bill 2017 contains an amendment to section 40-95(7) to enable a self-assessment of effective life for amortisation of certain intangible assets (for assets held after 30 June 2016) rather than the existing statutory effective life currently specified. For more information see the explanatory memorandum. Certain transport assets which have an effective life fixed by law. Certain assets have a cap on effective life. When shorter than the Commissioner’s determined effective life, and when the Commissioner’s Effective Life determination for effective life is selected, the capped effective life must be used when available. For rates and assets affected – see Capped Effective Life. If choosing or required to use the Commissioner’s estimate of useful life you will need to ensure that the schedule chosen is applicable to the year the asset was acquired. Year-by-year links to Effective Life Rulings can be found here. The existing immediate deduction for most depreciating “low cost assets” costing less than $1,000 or up to $1,000 of second element costs is superseded by the above $20,000 regime for the period of its application. For the period 1 July 2012 to 31 December 2013, there was a $6,500 instant asset threshold, with special rules for motor vehicles. Under the instant asset write-off provisions, the immediate deductions increase to $6,500 or $5,000 for motor vehicles costing more than $6,500. Asset costs in excess of these amounts may be claimed 15% in the first year and 30% in subsequent years. (Note the termination of this concession from 1 January 2014).